Yesterday's meeting of the Knowledge Management Association's DC Chapter was about integration (the joys and frustrations). Integration can mean many different things. 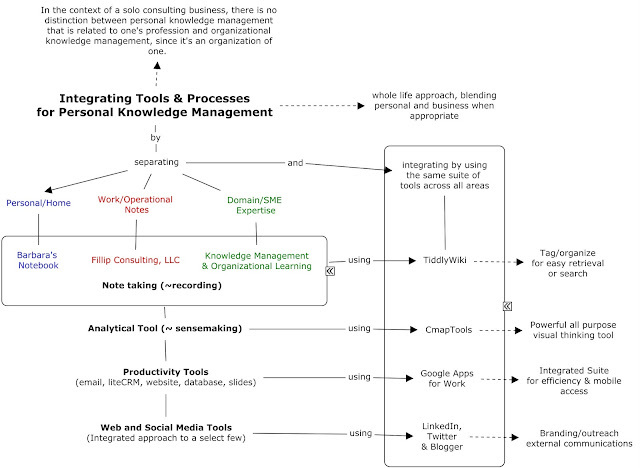 To me, from a Knowledge Management big picture perspective, it has to do with making sure that KM activities and the overall strategy are a good fit for the organization, are as embedded in the workflow as possible, and well "integrated" with related functions such as HR, training/mentoring/coaching, but also IT, business strategy development/planning, etc... In other words, KM should not be an add-on; it's part of how the organization works. Integration could also mean that as an employee looking for knowledge and information within the organization, I don't have to go to 20 different databases and disconnected networks that overlap and/or are incomplete. Most people would welcome a personal dashboard with key job-related resources at their fingertips. We often attempt to create something that resembles such a dashboard. For example, I use an image of my key performance goals on my desktop to serve as a framework for organizing key resources. It's my personal dashboard. The more common alternative is an overloaded bookmark manager in the web browser. I have struggled over the years with integrating my own set of personal knowledge and information management tools. I take my personal knowledge management very seriously (perhaps obsessively) but I have often felt quite disorganized about it. I always interpreted my perceived lack of organization as the result of my inability to stick to one tool for note-taking. I'm sure I've written at least one blog post -- if not multiple posts -- about deciding between paper and electronic notebooks, mapping tools vs. wikis, etc...when in fact the solution was perhaps just to re-frame the question and think about it from an integration standpoint. Consolidating everything into one or two tools does not necessarily make sense. The key is to be consistent in the use of each tool and find ways to connect and integrate when necessary. Below is a little map I came up with. Barbara's Notebook: The headers in this wiki are things like Toastmasters, Gardening, Food, Bike & Hike, etc... The first entry dates from 2008. It has 240+ entries with the tab "garden" and 122 with the tab "fiction". I also found journal entries from my first days working at NASA in 2008. Obviously at the time I wasn't following my current scheme of separating personal from work-related items. It would be quite interesting, since the data is there, to do a visual representation of the tags I used over time. I know I was very heavily into soundtrack music for a couple of years for example. Fillip Consulting, LLC is a TiddlyWiki I started in the fall of 2015 when I made the decision to go back to consulting. It's fun to read my journal entries from less than a year ago and realize how far I've already gone. This is where I will keep consulting related items from an operational standpoint. I've added some functionalities to handle task management and a simple taxonomy with the tag function. This will be for the business side of things. It has major content tabs like "Business Plan", "tasks", "projects", and "customers". 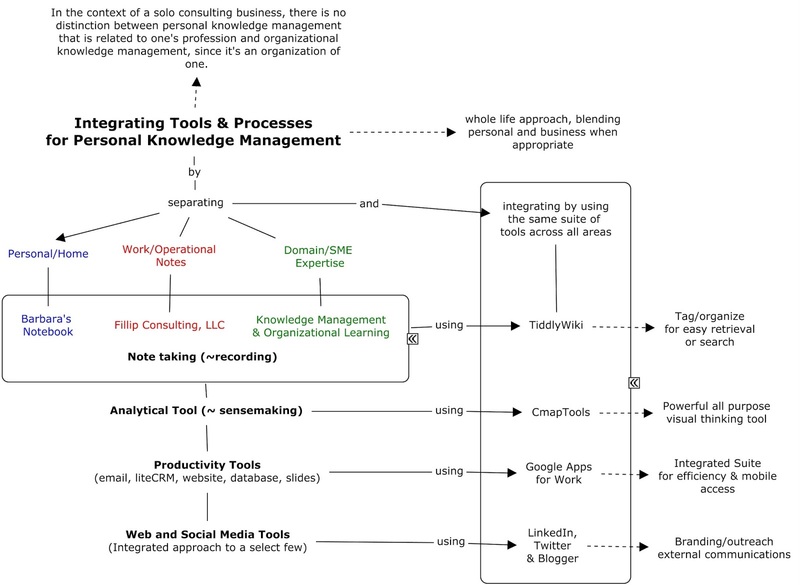 Knowledge Management and Organizational Learning is a TiddlyWiki apparently started in 2009 (the timeline tells me so) entirely focused on readings and research related to my area of profesisonal specialization or domain of expertise. Here the key tabs are "readings", "experts", "KM practices", and a glossary. I also have a closed/inactive TiddlyWiki that was called "Learning Log", which was a fascinating experiment in writing a didactic novel using a wiki format. A big shout-out to the inventor of the TiddlyWiki, Jeremy Ruston, and all the people who have worked on its improvements and variations over the years. Don't get me wrong, when I'm sitting in my hammock in the backyard to read a book or to brainstorm, I go for the old-fashioned pen and paper to take notes (and now, reading glasses).